When I was a little girl, I received The Song of Bernadette as a Christmas gift. The story of Bernadette and the apparitions at Lourdes captivated me, and I immediately decided that Bernadette would be my Confirmation saint years down the road. I recently re-read (and who knows how many times I’ve read it already) the book, and found that I am now able to appreciate the adult parts–the political, historical, and ecclesiological parts I used to skim. Not the least interesting fact about the story is that its writer is not a Christian, but a Jew, who wrote the story after he was hidden from the Nazis in Lourdes before making his escape to the United States. When I was in high school, my grandmother took me on a 17-day tour of France. The highlight was our visit to Lourdes (which Sister deLellis, my high school French teacher, had told us reminded her of a Catholic Gatlinburg). It’s true that cheap Catholic souvenir shops lined the main road to the Grotto, but miracle and mystery existed there too. Bernadette’s “lady” had asked that “processions come hither,” and every night thousands of pilgrims walk to the grotto carrying candles and singing “Ave Maria.” I cannot describe how beautiful and powerful it was. Bernadette was just a simple peasant girl, who retired to a convent and died a painful death from tuberculosis of the bone. Today is the anniversary of the day she died at the age of 34, and thus her Feast Day. Years after her death, Bernadette’s body was exhumed and was found to be incorrupt. 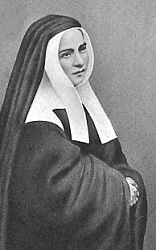 It is still on view today at the convent of the Sisters of Nevers, where she lived as a sister. Above the Grotto where the lady appeared are suspended crutches left behind those who were cured after drinking from or bathing in the miraculous spring. I took home several bottles of the water to use at home. My friends and I used to bless ourselves with it in college before we took our exams! If I had the money to travel, Lourdes would be one of the first places I would go. I had the blue pendant from Lourdes when I was a child. Unfortunately, I don’t know what happened to it. Oh, that’s too bad. I had a rosary with a drop of Lourdes water in it but eventually it evaporated! We bought back many bottles full when we went there but eventually used them all up. I took one away to college with me and my friends and I used to bless ourselves with it before exams! The incorruptibles spook me out – she is so lifelike still!! But, they also give me hope – because I firmly believe they are being preserved because of the “resurrection of the bodies” belief found in the Apostles’ Creed. This is fascinating… one chaplain I know goes every year (or twice a year) be a confessor at Lourdes – I, too, would love to visit Lourdes!